HTC has already started rolling out the official Android 7.0 Nougat for the premium smartphones like the latest HTC 10 and many of its variants. The company has also posted the latest Android 7.0 Nougat RUU firmware files on the official website and pushed it over-the-air as well. Now it’s time for the HTC One A9 to shine. The VP, Product Management at HTC has twitted that the HTC One A9 is going to receive the official Android 7.0 Nougat firmware update as soon as tonight. 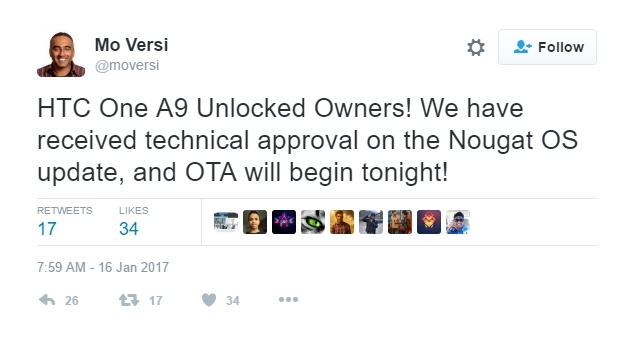 The tweet confirmed the technical approval for the OTA and will be pushed tonight. The popular HTC One A9 global unlocked variant shall receive the OTA and the full RUU firmware file very first. Other variants like the AT&T, T-Mobile, Sprint, Verizon HTC One A9 may soon follow. This is great news for all the HTC One series users. Moreover, as the latest flagship phone HTC U Ultra has been launched, the Taiwanese smartphone company seems to be desperate in releasing the Nougat OS update to attract customers. Install this OTA using the ADB sideload method. See how to install OTA using adb sideload method. See method 2 there. The HTC One A9 RUU and OTA will be aired tonight and the United States will be the first country to receive the Nougat update. Currently, the full RUU is only available for the previous Android 6.0.1 Marshmallow. In order to download the HTC One A9 Android 7.0 Nougat RUU, check out the official HTC support page. Check it tonight or tomorrow using different browsers or devices or clear browser cache. Once you have received the full RUU firmware, you can visit our tutorial on how to install RUU for HTC One A9. You will also find an older update to restore your device to complete stock. Previous Entry NVIDIA Shield TV Update 5.0 with Android 7.0 Nougat – Amazon Videos, Nvidia Games and more.